Tossed into a technicolor swirl for three brief seconds and then we're off. 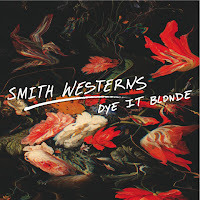 Smith Westerns' sophomore album Dye It Blonde wastes exactly no time giving you a riff to hold onto for the ride before it sends you reveling in its magic. "Weekend" is a brilliant opener in that it allows no room for questions; just listen, this is what we're doing tonight and it's going to be fun. For a sound that is throwback and heavy on reverb, the track is notably visceral and establishes the tone for a magnificent record. All of the songs are more than well crafted - they are exploratory and delightful at the same time. I am reminded of the first time I heard MGMT, except this dream seems a bit more deliberately constructed, with less impulse and more consistency. The production is masterful, and it has to be because the songs require a lot of space and color. The vocals are perfectly placed. With so much guitar up front they were in danger of becoming lost, but instead we are treated to duets between the lead vocal and lead guitar (see the beautiful "All Die Young" and closer "Dye the World"), and often both are exquisitely supported by echo-chamber backing vocals. The record was produced and mixed by Chris Coady, who deserves to be mentioned in the sparkling reviews I'm sure it is going to be getting. Influences are apparent and everywhere - The Beatles, T. Rex, perhaps even some Smashing Pumpkins - which is what gives Dye It Blonde its time-traveled sound. Late-album track "Smile" sounds like it could have been on Highway 61 Revisited if Phil Spector got his hands on a cut; it even begins with that oh-so-familiar snare snap from "Like a Rolling Stone." There is irony aplenty in the lyrics, something true of much that is written by the youthful for the youthful. Still, the melancholy, the ride and the youth itself come across as very genuine and provide evidence of a hell of a lot of talent. While yes, I am raving, I am not saying that this record is going to turn around the recession or anything. It's just very exciting to have such a great record come from a local band and find a national spotlight. I think its biggest accomplishment is that it fulfills the promise of Smith Westerns' debut by allowing them to establish a sound that is truly their own. This album should go a long way in helping this group grow as artists, increase their fan base and continue building on a distinct sound. If Dye It Blonde makes you feel like you just smoked a joint next to a fire in someone's backyard and then got in the car to drive through the summer night with the windows down, it's not because it's an album where the band discover their own identity. It's because it's an album where they knew their identity going in. 'Dye It Blonde' drops January 18 on Fat Possum. Smith Westerns will kick off a national tour later this month in support of the record, including a hometown show February 26th at the Empty Bottle. Check out one of the new tracks, "All Die Young," below.